The Expense Report - Report shows data at the expense report level, as opposed to the expense item level. This report will show total values from an expense report as a single line without the detail of the individual expenses within the expense report. 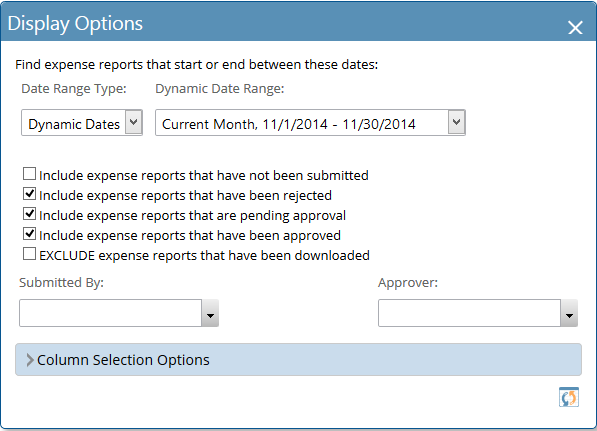 More detailed information on reports containing expense information can be found in the Expense Entry Reports topic. The initial display for the Expense Report report defaults to the current month. Setting dates allows for the selection of a "Date Range Type"," the first of which is an "All Dates" selection. The five check boxes below will include or exclude the resulting time sheets on the report based on which boxes are checked. Filter by specific resources by selecting from the Submitted By or Approver drop downs of Project Insight Users.